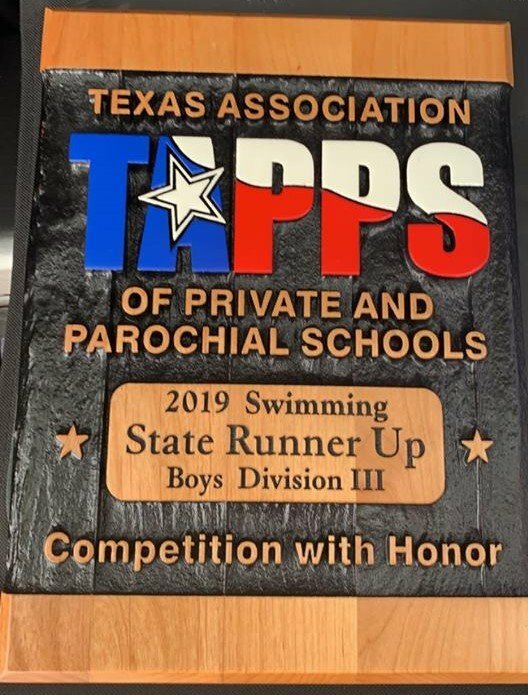 The Legacy Prep boys also had a strong performance at the state championships, finishing second in the Division III meet with a score of 187. The Lions finished just five points behind Veritas Academy (192) and beat out Logos Prep (150), Boerne Geneva (145) and Concordia (144). Legacy Prep started the day with a silver medal in the 200-yard medley relay with a time of 1 minute, 49.67 seconds. That team was comprised of Gavin Gerwick, Sam Granack, Joshua Prior and Sean Stepanik. Gerwick, a freshman, took fourth place in the 200-yard freestyle at 1 minute, 56.88 seconds. Granack, a junior, then followed with a fourth-place finish in the 50-yard freestyle with a time of 22.67 seconds. He also earned a bronze a short time later with a swim of 49.94 seconds in the 100-yard freestyle. Stepanik got into the action with a third-place finish in the 500-yard freestyle, clocking in at 5 minutes, 58.84 seconds. Gerwick then captured his second medal in the 100-yard backstroke at 58.60 seconds. The Lions also picked up a silver medal in the 200-yard freestyle relay as the team of Gerwick, Prior, Stepanik and Granack touched the wall at 1 minute, 40.39 seconds.